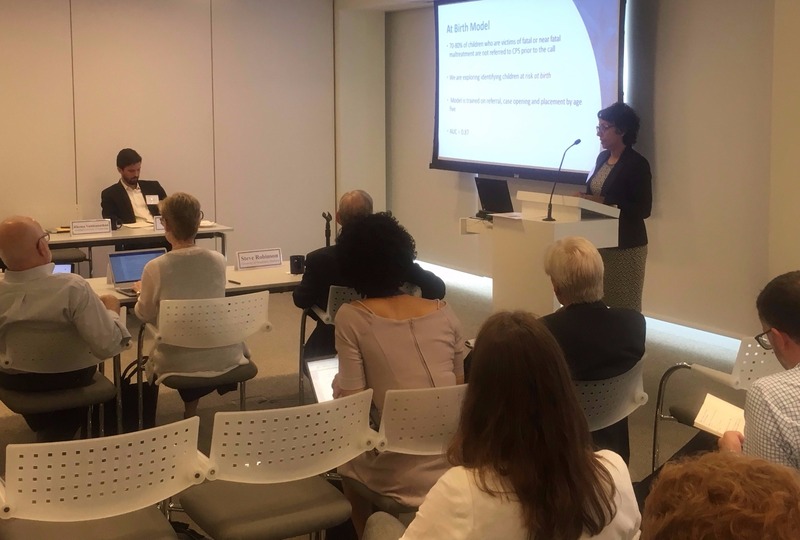 CSDA co-director Rhema Vaithianathan travelled to Washington DC recently to address a US expert meeting about the future of predictive analytics for human services. Rhema was one of several sector experts who provided updates about the ‘state of the art’ of predictive analytics in different human (social) services areas. She gave an overview of current and future directions for predictive analytics in youth and family services. Other areas discussed included education and criminal justice. The meeting, hosted by the US National Academies of Science, Engineering and Medicine and the Annie E Casey Foundation, was an opportunity for cross-sector information sharing and discussion of common challenges. Attendees represented universities, agencies, funders and NGOs actively working to progress the use of predictive analytics in human services. “It was a privilege to be invited, along with our US collaborators, to share insights at this level about what we have learnt, and where we see the field heading. This was a really important opportunity for us to further our connections with US researchers, funders and agencies that are working to realise the potential of predictive analytics for good,” said Rhema. As well as talking about current opportunities and methodologies, the meeting had a strong focus on the social, ethical and legal dimensions of working with predictive analytics.